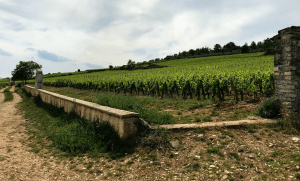 A few quick thoughts on the 2013 Domaine Coquard-Loison-Fleurot Chambolle-Musigny. 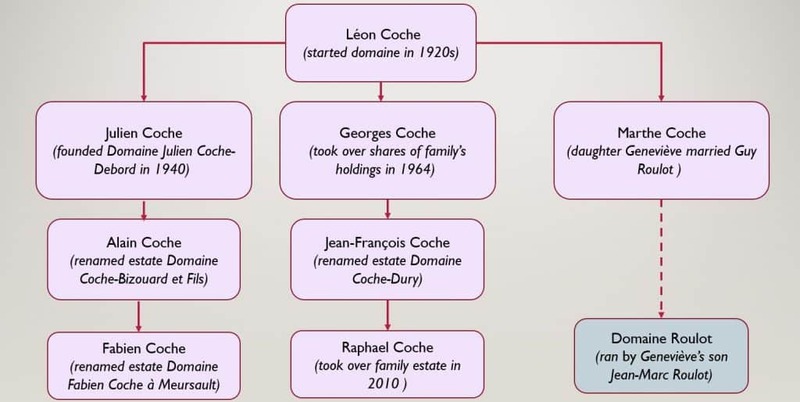 Domaine Coquard-Loison-Fleurot (CLF) is a 5th generation family estate currently ran by cousins Claire Fleurot and Thomas Colladot. For years, the fruit from their enviable holdings in the Grand Crus of Grands Echezeaux (0.18 ha), Echezeaux (1.29 ha), Clos de Vougeot (0.64 ha), Clos de la Roche (1.17 ha), Clos St. Denis (0.17 ha) and Charmes-Chambertain (0.32 ha) went to négociants. But since 2010, when Thomas took over winemaking, they have been domaine bottling over 90% of their production. 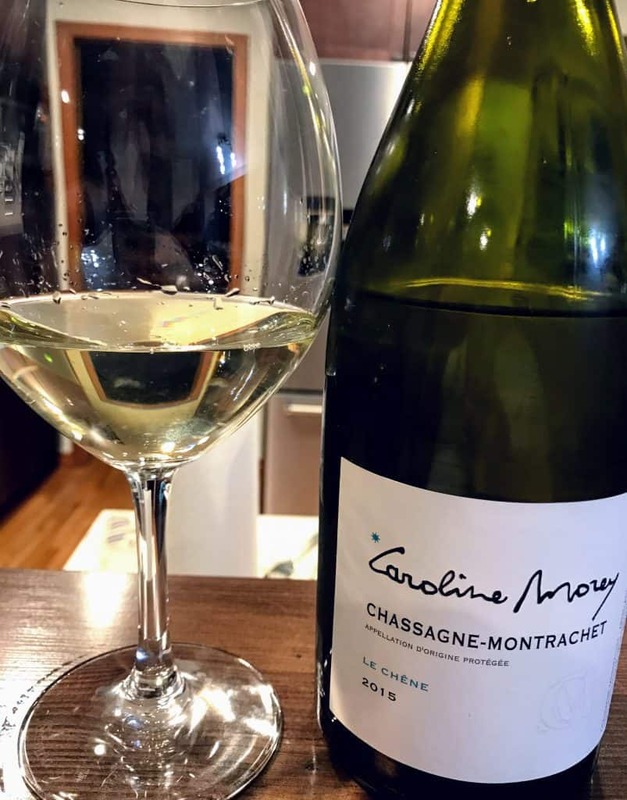 Recently, Neal Martin of the The Wine Advocate has described CLF as “…your new favorite domaine” that has flown under the radar for many years but likely won’t for long. The Chambolle-Musigny comes from 0.8 ha of vines located just below the premier crus. 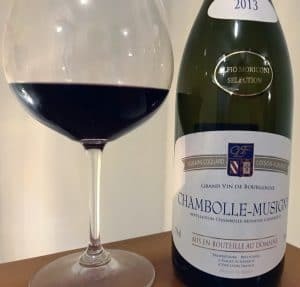 In The Wines of Burgundy, Clive Coates notes the high quality of village-level wines in Chambolle-Musigny is partly attributed to their being so little of it. 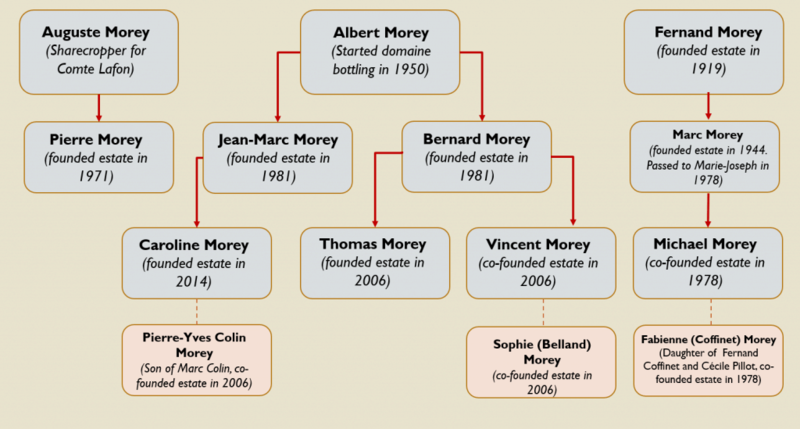 The high portion of limestone and low fertility means that Chambolle-Musigny always produces far less wine than neighboring communes like Morey-St-Denis and Vosne-Romanée. The Combe de Chamboeuf between the Grand Crus of Bonnes Mares and Musigny often deliver hailstorms. In many vintages, this further reduces yields. But while 2013 saw hail devastate the Côte de Beaune, Chambolle-Musigny was relatively untouched that vintage. Medium-plus intensity nose. Very floral but it also has an exotic black olive and Asian spice note that is very intriguing. The black plums are well balanced by the fresh acidity in this wine. On the palate, dark fruits emerge like black plum and black cherry. The medium-plus acidity balances the fruit well. The medium tannins have a soft, silkiness to them. Lovely and long finish. At around $75-85, this is a screaming bargain compared to the village level 2013 Chambolle-Musigny wines from estates like Comte de Vogue (ave $164), Mugnier (ave $142) and Roumier (ave $178). 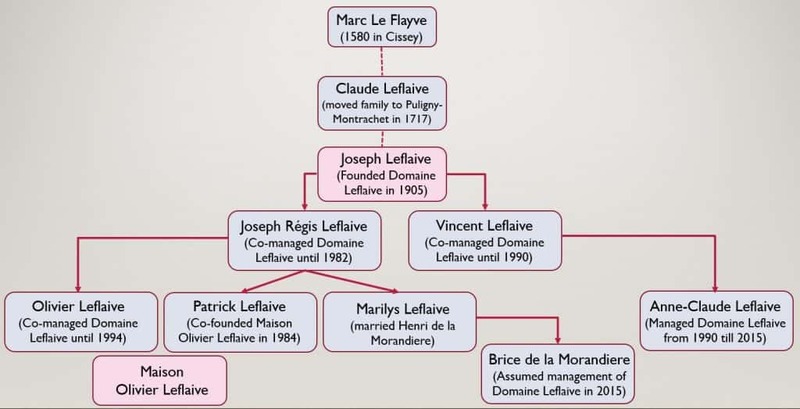 While Coquard-Loison-Fleurot hasn’t achieved the level of acclaim as those estates, it may be worth taking Neal Martin’s advice and discovering this domain before everyone else catches on. Tagged Bonnes Mares, Burgundy vintages, Chambolle-Musigny, Charmes-Chambertain, Clive Coates, Clos de la Roche, Clos de Vougeot, Clos St. Denis, Comte de Vogue, Coquard-Loison-Fleurot, Côte de Beaune, Échezeaux, Grands Echezeaux, Morey-St-Denis, Mugnier, Musigny, Neal Martin, Roumier, The Wines of Burgundy, Thomas Colladot, Vosne-Romanée, Wine Advocate. A few quick thoughts on the 2007 Domaine Poisot Romanée-Saint-Vivant Grand Cru. Domaine Poisot began in 1902 when Marie Poisot inherited half of her father, Louis Latour’s, estate with her brother, Louis, taking the other half. 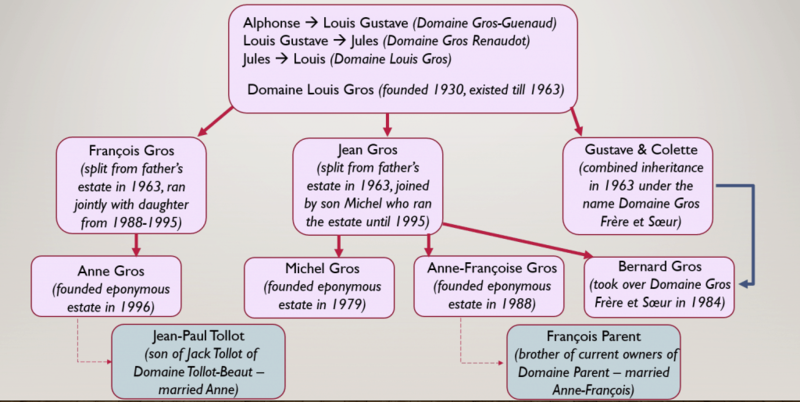 For many years, the Poisots parcels were farmed in agreement with Maison Latour but starting in the 1980s, Maurice Poisot, grandson of Marie, began taking back the family plots. In 2010, Maurice’s son Rémi, a captain in the French Navy, returned home after 28 years at sea to take over the estate. 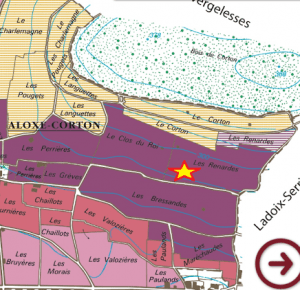 The tiny domaine owns around 5 acres that includes choice parcels in the Grand Crus of Romanée-Saint-Vivant (1.2 acres), Corton-Charlemagne (1.4 acres) and Corton-Bressandes (1.06 acres) as well as holdings in Pernand Vergelesses 1er Cru en Caradeux (0.89 acres). 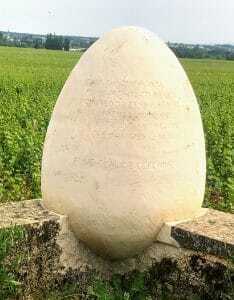 According to Clive Coates in The Wines of Burgundy, the parcel of Romanée-Saint-Vivant that Poisot owns is in the southwest corner of the Grand Cru, just below Romanée-Conti, in the section known as Clos-des-Quatre-Journaux and was historically farmed by the Benedictine monks of Saint-Vivant de Vergy for over 650 years. They share this section of the Grand Cru with other notable domaines like Arnoux, Domaine de l’Arlot, Sylvain Cathiard and Dujac. The section that l’Arlot farms used to belong to Remi’s uncle, Henri Poisot, who sold it in 1990. Lots of red cherries in this Burg. Medium intensity nose. Some floral herbal notes–fennel and sage. Red fruits like cherries and currants dominant. Fairly youthful aromas for its age. On the palate, those red fruits carry through and bring some subtle oak baking spice like cinnamon and cloves. The herbal notes also carry through and married with the medium-plus acidity, give a savory juiciness to the wine. Medium tannins and medium body do contribute to the silkiness characterized of Romanée-Saint-Vivant but the finish is very short. An interesting wine that was fun to try but not quite worth the $245-260 to buy. It’s clear that the domaine is going in a new direction with Rémi Poisot in charge. It’s certainly worth keeping an eye on. Tagged Arnoux, Caradeux, Clive Coates, Clos-des-Quatre-Journaux, Corton-Bressandes, Corton-Charlemagne, Domaine de l’Arlot, Domaine Poisot, Dujac, Grand Cru, Louis Latour, Pernand Vergelesses, Romanée-Saint-Vivant, Saint-Vivant de Vergy, Sylvain Cathiard, The Wines of Burgundy. 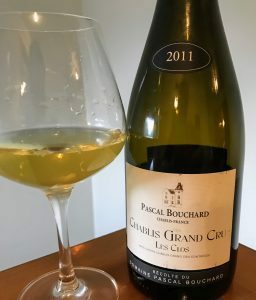 Some quick thoughts on the 2011 Pascal Bouchard Chablis Grand Cru Les Clos. 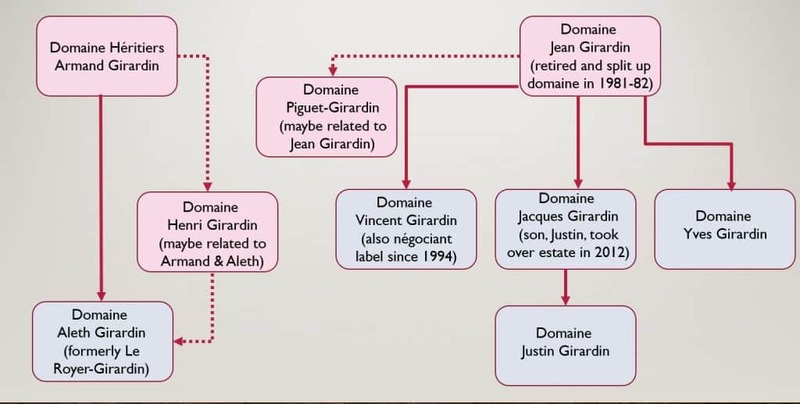 Clive Coates notes, in The Wines of Burgundy, that the domaine of Pascal Bouchard was founded in 1979 when Pascal and his wife Joëlle inherited vines that belonged to her father André Tremblay. Today the domaine is ran by their son, Romain, and covers a little over 81 acres–including vines in the Grand Cru climats of Les Clos, Vaudesir and Blanchot. Pascal Bouchard also owns several choice plots of Premier Cru vineyards including Fourchaume and Mont de Milieu on the Grand Cru side of Chablis and Beauroy, Montmains and Vau de Vey to the west of the Serein river. The vineyards are farmed sustainably with the avoidance of chemicals and pesticides. The Grand Crus are aged in oak (15% new) for at least 12 months on the lees though they do not see any bâtonnage to ensure freshness. Les Clos is the largest of the Chablis Grand Crus with the vines facings south between Valmur and Blanchot. The wines are noted for their racy minerality and depth that often require bottle aging. Other notable estates that produce wine from this vineyard includes Francois Raveneau (Wine Searcher Ave $708), Rene et Vincent Dauvissat-Camus (Ave $247) and William Fevre (Ave $108). Medium-plus intensity nose. Lots of citrus aromas, both the pulp and pith. There are also some floral notes adding depth. On the palate, those citrus notes carry through and you can feel the weight from the oak. There is distinct minerality, especially on the finish with some salinity wrapping itself around the citrus flavors. Mouthwatering and savory. Medium-plus acidity gives freshness. Les Clos’ age-worthiness certainly stands out in this wine which was surprisingly fresh for 6+ years. 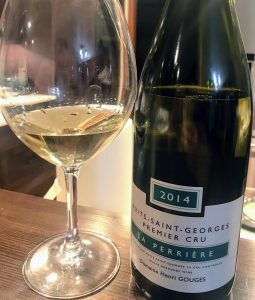 The noticeable weight of the oak and “pithy” tannins are a bit unique from stereotypical stainless steel Chablis but the terroir’s minerality still shines through and adds savory complexity. It’s a very characterful Chablis Grand Cru that is well worth $90-100 but it’s certainly not a benchmark example. Tagged André Tremblay, Beauroy, Blanchot, Chablis, Clive Coates, Fourchaume, Francois Raveneau, Grand Cru, Les Clos, Mont de Milieu, Montmains, Pascal Bouchard, Rene et Vincent Dauvissat-Camus, Sustainable Viticulture, The Wines of Burgundy, Valmur, Vau de Vey, Vaudesir, William Fevre. 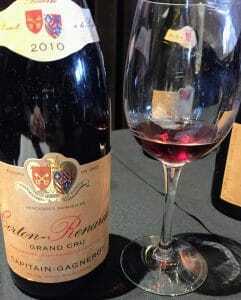 Some quick thoughts on the 2010 Maison Capitain-Gagnerot Corton-Renardes Grand Cru. According to Clive Coates’ The Wines of Burgundy, the Capitains’ history in the region dates back to the 17th century. Domaine Gagnerot was established in 1802 with the Capitain family joining it in marriage in 1864. Today Capitain-Gagnerot is managed by the current generation of Patrice and Michel Capitain who tend to almost 40 acres that includes not only around 0.8 acres in Corton-Renardes but also plantings in the Grand Crus of Corton-Charlemagne, Échezeaux, Clos Vougeot and the greater Corton Grand Cru. They also own the premier cru monopole of La Micaude in Ladoix-Serrigny. Les Renardes is one of 25 climats on the hill of Corton and is considered one of the more highly regarded climats of the Grand Cru along with Clos du Roi, Les Bressandes, Les Perrières, Les Pougets and Les Grèves. The climat of Les Renardes on the Aloxe-Corton side of the Grand Cru Corton. Photo courtesy of Atlas Vins from Jacques Michot – Sepia Art & Cartographie. Medium intensity nose. Some red fruits but mostly earthy forest floor and savory “chicken herbs”–rosemary, thyme, marjoram and sage. It’s not quite define which herbs but smelling this wine makes me think I’m by the rotisserie at Costco. On the palate, the wine has medium plus acidity and firm medium tannins. The acidity amplifies the red fruit flavors and gives them more precision as cherries and pomegranate. The savoriness from the nose carries through but it is still not very defined. This is a hefty and very dense Grand Cru Pinot noir that is probably in its awkward adolescence. You can tell that there is a lot of layers of complexity waiting to unfurl but it is not there yet. The hints are there, especially with the intriguing savoriness. At around $150 for a Grand Cru from a good quality vintage, I can see this eventually living up to its price and is worth squirreling away a couple bottles in the cellar for another 5 to 10 years. 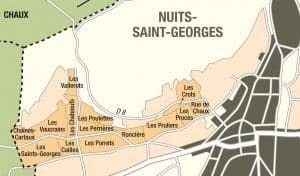 Tagged Aloxe-Corton, Clive Coates, Clos du Roi, Clos Vougeot, Corton-Charlemagne, Corton-Renardes, Échezeaux, La Micaude, Ladoix-Serrigny, Les Bressandes, Les Grèves, Les Perrières, Les Pougets, Les Renardes, Maison Capitain-Gagnerot, monopole, Pinot noir, The Wines of Burgundy.